Owen, our dog, reacts to the words “dog park” the same way canines of the world do when they hear “walk” or see their owners putting on shoes that signal “I’m going outside and maybe, just maybe I’ll take you with me.” But his view of Doggie Disneyland may be changed forever after a dog attacked him at Magnuson Dog Park last weekend. We’d just walked into the park — seriously, this happened in the first 90 seconds — when a mid-sized dog rushed over. I assumed it was going to be the traditional exchange of sniffing greetings, but this dog pounced on top. Unfortunately, we didn’t know how much damage the dog had done until later. 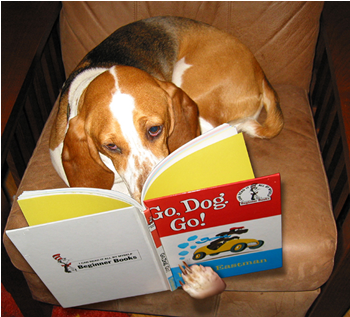 Now, look at Owen, pictured here in his favorite chair enjoying a classic book: Can you imagine this guy in a scuffle? He is completely loveable and optimistic, assuming that all dogs and people are good. Anyway, a day at the vet and some antibiotics and Owen is on the mend. Worse than his eye and neck injuries was the change in his behavior. We knew he’d reached the depths of depression when the UPS truck (his absolute favorite vehicle) drove by and he didn’t even bother with a single bark. Saddest story and cutest picture ever.